“Every day, blind Bartimaeus would wake up and feel for his cloak. He would put on the beggars cloak that allowed him to sit and beg. But today, every one says, ‘Take it off!’” said Pastor Russell Evans in the Planetshakers Awakening Conference, at Sunway Convention Centre from 29th to 30th of January 2016. Although Bartimaeus wakes up every morning to beg, that day was a special day for him because he heard Jesus passing by with a crowd. 46 Now they came to Jericho. As He went out of Jericho with His disciples and a great multitude, blind Bartimaeus, the son of Timaeus, sat by the road begging. 47 And when he heard that it was Jesus of Nazareth, he began to cry out and say, “Jesus, Son of David, have mercy on me! Is there a cloak of fear and insecurities that you are wearing now? Take it off. Pastor Russell shared how a prophet told him not to compare himself with his family of preachers, because God will be anointing his lips to speak to nations. He obeyed God and took off his father’s mantle in preaching, his fear in speaking, and his fear in flying. Many of us have defined ourselves based on our past successes, degrees, or jobs. But what really defines us is that we are the sons and daughters of God. Leave yesterday to yesterday, because God wants to do a new thing in our life today. So, responding to Jesus’ calling, blind Bartimaeus came to Jesus. (Mark 10:50) He took a step of faith in darkness towards Jesus. Are we stepping out like Bartimaeus by faith and not by sight today? In other words, we must first hear what God says, do and say what He says, and then only see what He says become a reality in our lives. For example, Pastor Sam Evans heard God wanting her to speak healing into a man. So, she walked up to the man and spoke healing into him. Only then, she saw the physical healing of the man. 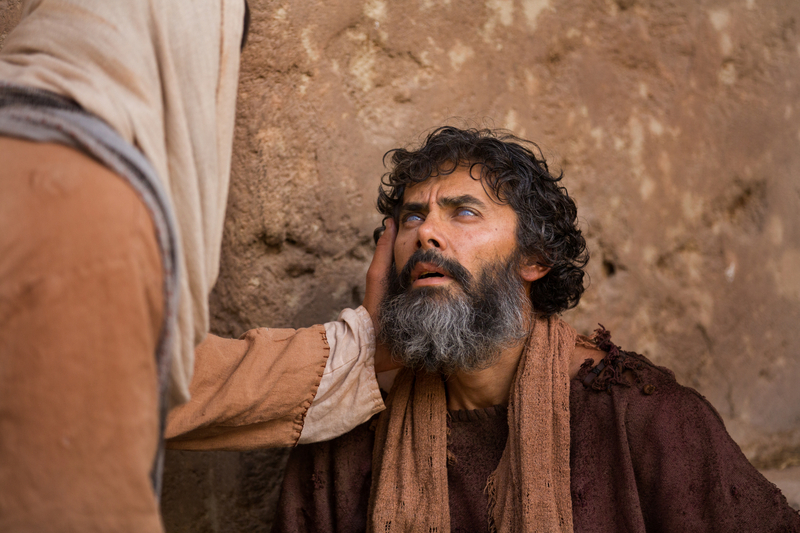 When Bartimaeus came, Jesus asked him the most peculiar question, “What do you want Me to do for you?” (Mark 10:51) It would be apparent that this man wanted his sight back. How did Jesus respond? Jesus honored his request. He said to him, “Go your way; your faith has made you well.” Immediately, Bartimaeus receives his sight. (Mark 10:52) Hallelujah! But before Bartimaeus receive his healing, he need to first take off his cloak of fear, insecurities, and past successes. Pastor Russell shared how the beggar’s cloak of performance seemed to be especially prevalent in the Asian culture. We believe that we need to perform to get approval. We get our identity from what we have done, instead of what Jesus has done for us on the cross. Bartimaeus took off everything that defined him, so that he can receive all that Jesus wants to give him. Hence, like Bartimaeus, we need to also disagree and take off every negative word said to us. But we need to come into agreement with all that Jesus says about us in the Bible – that is we can do all things in Him! Even Pastor Russell’s 80-year-old grandfather had to come before Jesus and took off things not from God. He later got up and wrote his first song in life to praise God. When God created you, He intended you to be filled only by all of Him. But before He fills us with all of Him, we need to take out everything that is not of Him. Father God, I take off everything that is not of You, the Son Jesus Christ, and the Holy Spirit. I only receive all that is of You, the Son Jesus Christ, and the Holy Spirit. Thank you Lord Jesus. In Jesus Christ we pray. Amen. Planetshakers will be coming to Malaysia next year, on 20 – 21 January 2017. See you there! Note: Although this article has not been vetted by Planetshakers, it has been written based on the audio recording of Pastor Russell Evans’ sharing. The Lord granted a NEW Brain!